I attended the American Quilt Study Group's annual seminar in San Jose last week, a real treat for quilt historians. It's so much fun to talk to old friends who have the same interests. Most of us have terrific visual memories. We never forget a quilt pattern (although we occasionally forget each other's names). 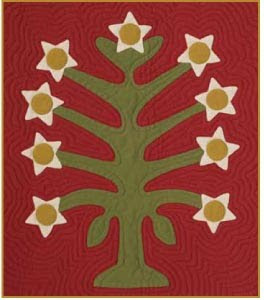 Among the best is Kathy Sullivan from North Carolina, who was quick to identify the inspiration for the "Star Flower" design in the center of our new Juniper and Mistletoe sampler book. She'd seen a photo of a quilt made in a similar pattern, which she'd thought was so quirky that it must have been an original design. I'd seen another quilt in the design, one in the collection of the International Quilt Festival Collection in Houston. Both are related to a pattern published in Comfort magazine in April, 1923. 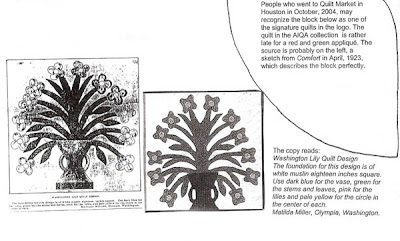 Several years ago I did a newsletter about 20th-century quilt pattern sources and below is a photocopy of a page featuring the original clipping on the lower left, an applique design sent to the magazine by Matilda Miller of Olympia, Washington. 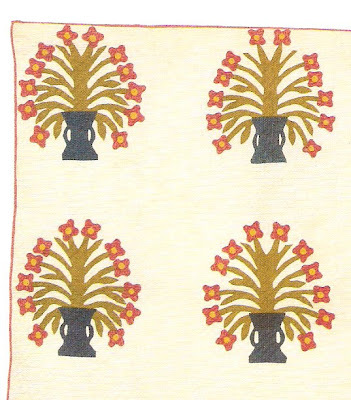 It was published as Washington Lily Quilt Design, named for her home state. The magazine advised a color scheme of a dark blue vase, green stems and leaves, pink for the lilies and yellow centers. 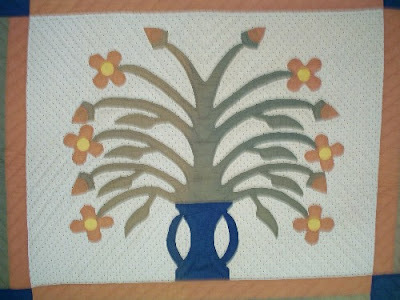 I took out the vase and changed the "Washington Lily" design a little to make it more like a tree for our "forest of applique". 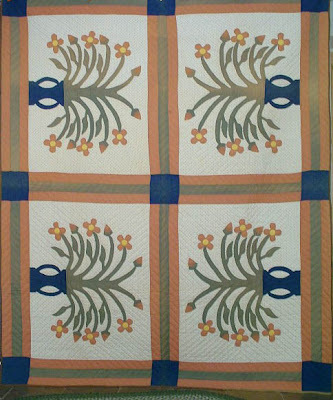 I would imagine the old quilt with the shrimp-colored sashing once had red sashing and flowers. The blue vase, so similar to the magazine pattern, makes me think the quilt below was inspired by the magazine and made after 1923 when dyes were very unreliable. The unknown maker exercised her creativity in alternating buds with flowers. 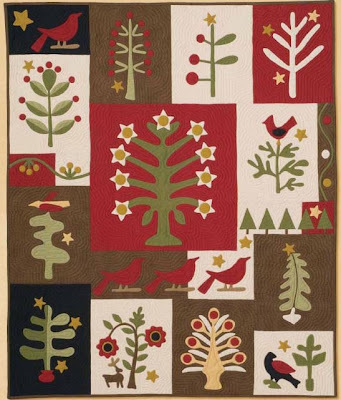 Of course--- this quilt might have been the inspiration for the Comfort pattern. Which came first? Chicken or egg? Quilt or quilt pattern? Absolutely beautiful. Thanks for sharing your insights. Love the pieces from the new book, might be one I need in my stash. 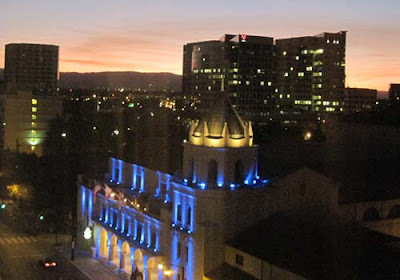 Thanks for the AQSG hotel view pic, I loved the civic auditorium all lit up but didn't take a photo. Seminar was terrific. The special exhibits were amazing. I enjoyed seeing your ebay purchase too.